The races are coming thick and fast at the moment. This weekend the ECCA 100, then a few days later the UCI elite mens British time trial in Lincolnshire. There is a smattering of time trial regulars on the BTTC startsheet – but it looks a little more like a truncated Premier trophy road race, with a few top pros flying in from the continent. It will be an interesting battle between Alex Dowsett (former World Hour record holder) and Geraint Thomas (winner of this years Tour of Algarve, E3 Herelbecke and one of most accomplished all-round pro riders). I’m worried that doing a 100 mile TT on Sunday may not be best preparation for short TT race on Thurs, but at least I won’t have the Tour of Switzerland miles and climbs in the legs like Geraint Thomas. 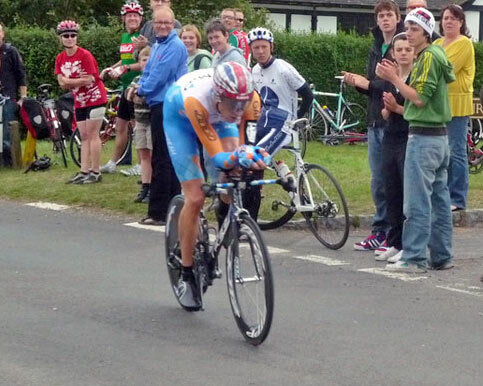 I started doing the BTTC in 2006, where I think I finished 14th. Since then the quality and depth of the field has increased quite significantly. There are many really quick riders on the startsheet, who kind of slip through the radar – such is the quality in depth of British cycling at the moment. Despite going to all the effort (and expense) of getting my time trial bike UCI ready, I haven’t really been targeting the short stuff. My training is more geared towards the longer distance time trials. This year I’ve changed training plans somewhat. I’ve done less hill climb intervals and more four hour rides where I’m keeping a high tempo. I understand level 3 to be an intensity of training just below the pace you could maintain a long time trial. It refers to that ‘sweet spot’ of training which is hard work, but does not generate any significant levels of acidosis and muscle damage that you get from racing. Because it is a high tempo, you get a good training effect, but relatively limited levels of fatigue. It enables a build up in form, and the scope to have a bigger training volume. You could think of it as two different ways to improve fitness. One is to push from below. i.e. train at an intensity less than what you race. Here you improve the basic aerobic fitness and hope it enables higher speed. Another is to pull from above. Interval training at efforts above race pace. Hoping to improve speed and fitness by working at a very high intensity to work all the different muscle fibres. Both ways can increase fitness – which is the best is a good question. But, I’m saving the intense intervals for later in the year. I probably have a FTP (functional threshold power) of around 315-20 watts (I haven’t done any test). A level three ride is around 220-240 watts. The average power in a hundred mile TT is around 260 watts. I enjoy these four hour rides because every ride is a chance to use some different roads and explore some part of the Chilterns or Cotswolds. It’s a good effort, but not quite as exhausting as 2-3 hours of intense hill climb efforts. I’ve been doing quite a lot of what you might call level 3. But, even then it’s not rigid. Old habits die hard, see a hill, and it’s hard to resist. On some of the four hour rides, I will do 5-7 hill climb intervals – not at 100% max effort – but at a pace, just above 10 mile TT pace. So there is a mix of base, tempo and really intense race efforts. The consequence is that the miles have been building up (roughly 250- 300 miles per week), I’ve done more miles than any other season. But, I don’t particularly feel tired, there’s more in the tank. As the season progresses towards hill climbs, hopefully I will have a very good aerobic base, but still potential to increase the intensity of the training for the more specific shorter stuff. Hello mate, I’ve been an avid reader and follower of your site for years, never thought I’d have someone to pass my legacy onto but my 45 year old son as Stepped into the breach which is a relief. I have past the link onto your website and I hope he takes to reading it as I have over the years. Thanks for all your previous and future help and many happy hours of reading….